Edmonds, a Seattle suburb long dedicated to the arts, was named the state’s first Certified Creative District last November, a legislative program designed to support the state’s creative economy. A tour of its compact downtown shows off why: you’ll find public art installations, museums, galleries and boutiques, all set within walking distance of Puget Sound and the Edmonds ferry terminal. Check out the Scene. 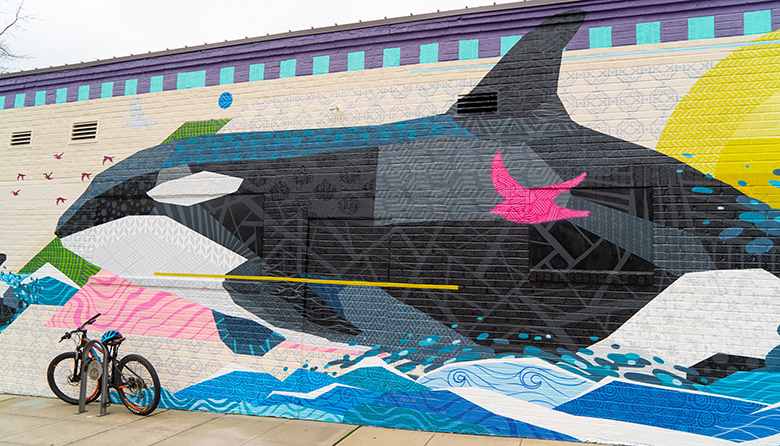 The self-guided Murals Walking Tour (itinerary here) of the historic downtown (incorporated in the late 1890s) showcases more than a dozen murals by Pacific Northwest artists. As you explore downtown, stop at Zinc (102 Third Ave. S; 206.467.1027), your go-to for artwork, furniture, pottery and jewelry, all from local artists. At the Cascadia Art Museum (190 Sunset Ave. S; 425.336.4809), work by women and minority artists is frequently featured. International and local artists perform at the Edmonds Center for the Arts (410 Fourth Ave. N; 425.275.9595). After the performance, check out Iole Alessandrini’s “Luminous Forest” (Fourth Avenue N, between Daley and Main streets), an installation of LED lights embedded in the roadway, best experienced after dark. Join the Crowd. Locals and visitors will fill downtown streets on April 18 for Art Walk Edmonds (free, 5‒8 p.m., third Thursday of each month), when galleries and other merchants, including frequent fliers such as Cole Gallery (107 Fifth Ave. S; 425.697.2787) and Cafe Louvre (210 Fifth Ave. S; 425.640.8188), host local artists along with presenting art demos, exhibits, food and music. Sustenance with Style. Downtown offers multiple options for meals and snacks. Start the day at Red Twig cafe and bakery (117 Fifth Ave. S; 425.771.1200) for brunch, pastries and your favorite cup of java, or grab a locally sourced and handcrafted panino or crêpe (gluten-free options available) for the road. Demetris Woodstone Taverna (101 Main St.; 425.744.9999), on the waterfront, is a favorite lunch spot known for its indulgent flatbreads. For a date night, head to neighborhood bistro Epulo (526 Main St.; 425.678.8680), with its Mediterranean-influenced menu. And to drink with locals, stop by Daphnes bar (415½ Main St.), where the petite space all but guarantees table conversation with those to your left and right. Browse and Shop. Retail is alive and well here. Among the choices: Teri’s Toybox (420 Main St.; 425.774.3190), with its array of wooden and European toys; C’est la Vie (320 Fifth Ave. S; 425.673.8905), specializing in understated jewelry and home décor; and women’s clothing boutique Saetia (120 Fifth Ave. S; 425.582.2167). Stretch Your Legs. When you’ve had your fill of shopping, head to nearby Brackett’s Landing North (50 Railroad Ave.) to explore the sand and jetty, and to watch for divers heading out to Edmonds Underwater Park, one of the state’s top 10 underwater dive parks. Edmonds is about 17 miles north of Seattle, via Interstate 5.